NASA’s twin Voyager spacecraft launched in August and September 1977. 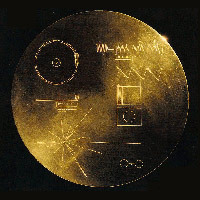 Aboard each spacecraft is a Golden Record, a collection of sites, sounds and greetings from Earth. If a new Golden Record were to be created, what one item from the past 30 years would you include? Give us your ideas by Sept. 5, 2007 (the 30th anniversary of Voyager 1’s launch) and our Voyager Mission team will pick what they think would be the best additions. Just click on the Comment link at the bottom of this page.